As a part of the new user on-boarding process, the organization allows their users to fill few details on user detail page (Or some other object) like Date of birth, etc. As these are the key fields related to their employee insurance policies, the organization doesn‘t want to allow their users to change the data for these fields once they are done with the on-boarding process. In this article I am going to discuss, how you can use Permission Sets, Flow and Process Builder to manage it. Let’s start with a business use case. Pamela Kline is working as System administrator at Universal Containers (UC). 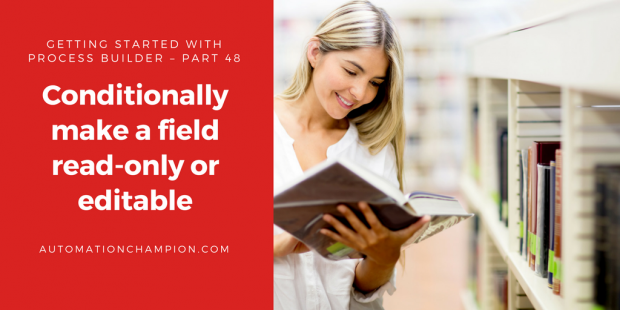 She has received a requirement to make a field Date of birth read-only based on the value of the fields. If the field is populated by the user (Profile: – Sales Reps EMEA), then they are not able to edit this field anymore. There are a few possible solutions for the above business scenario, but I’ll use Permission Sets, Process Builder and Flow to solve the above business requirement. Before proceeding you have to understand PermissionSetAssignment objects in Salesforce. PermissionSetAssignment: – This object represents an association between a User and a PermissionSet. AssigneeId ID of the user to assign the permission set. PermissionSetId ID of the PermissionSet to assign to the user. 3. Create a validation rule on the User object so no one can change the Date of birth field on his/her behalf. It means only a user can change his/her Date of birth. 5. Click on New Flow, it will open the Flow canvas for you. Now create few Text variables VarT_UserId, VarT_DateOfBirth, VarT_PermissionSetId to store the user’s Id, Date of birth and Permission Set ID (we will pass the user Id, Date of birth through Process Builder). 10. Save your flow with name Conditionally make a field read-only and close the canvas. Don’t forget to Activate the Flow. 1) For the new user, it will work as per our designed no additional setup is required, but for the existing users (Profile: – Sales Reps EMEA) you have to assign the Permission Set (Grant Date of Birth Edit access). Essential article to keep data clean along the Salesforce way! Hi Rakesh, the process is working find when I try to edit the field after updating DOB. However, it is not assigning the permission set to new users. Good one! Will try this.